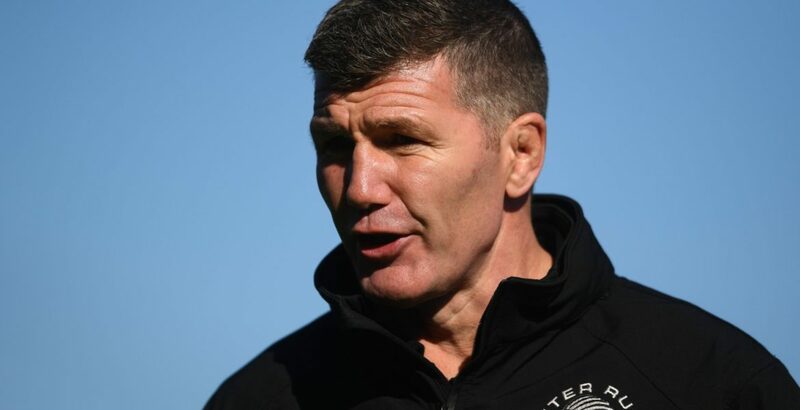 Exeter Chiefs boss Rob Baxter says his side must adopt a mentality that shows they want to win the Premiership title. The bonus-point win over Bath on Sunday assured them of a play-off semi-final. "It's for us to keep collecting points as quickly as we can to try and get that home semi-final," Baxter said. "But even more importantly than that make sure we're training and playing week by week in a way that looks like a team that's genuinely got ambitions to win the whole thing." Baxter's men have reached the last three Premiership finals, with losses to Saracens in 2016 and 2018 interspersed with their only title victory when they beat Wasps in extra time two years ago. "You don't turn up on the day to win it, I think you do it in every day and every action you make, and we've got to start driving that now," he told BBC Radio Devon. Exeter are nine points ahead of Saracens and need one more win to guarantee at least second place and a home semi-final. Since their first foray into the post-season in 2016, they have never finished lower than second and topped the regular-season table for the first time last year. "What's to come is as much a mental battle as it is a physical one," added Baxter. "The truth is how these lads lock down now and decide what they want everything to look like and feel like. "We've got to hand a lot to them, we've got to hand a lot of the responsibility of how do they want to turn up and train on Wednesday? How do they want to turn up and play against Leicester? "We've got to travel to Saracens again, how are they going to turn up there? Are we going to go there and say 'this game doesn't really matter'? There are some challenges we can face and I'm intrigued really to see how the guys decide this can go. "We can guide them as coaches, but the path they take is very much going to be down to what they choose to do."